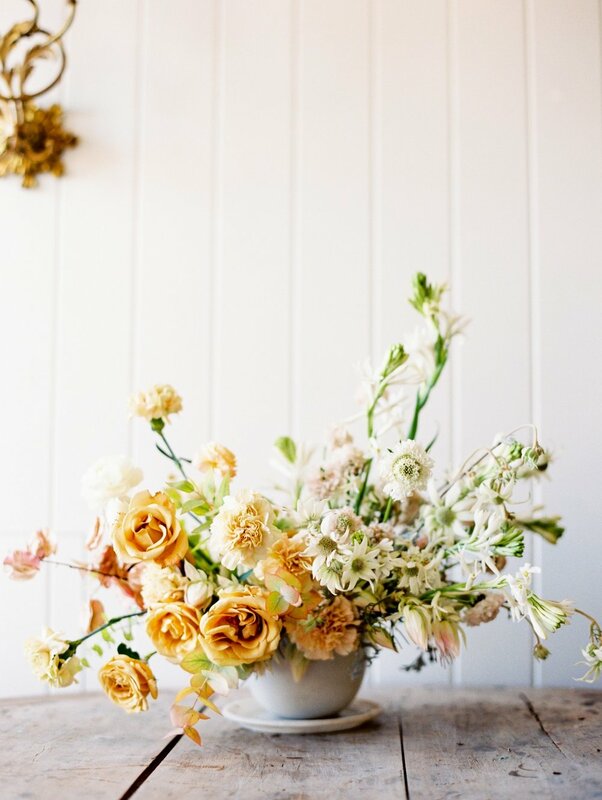 A one on one session back in April with Everly Alaine Florals photographed by Heather Nan. I can't believe it took me this many years to incorporate iris into my work. They smell like gummy peach candy and the color variances are so inspiring. Thanks to Tess Comrie for these photos. The other day I was talking with a friend about motherhood and the way it's impacted my life. She asked what my favorite part about it has been and my answer I've found is getting to witness my baby become who she is. As a parent I get to see her inherit qualities, the person she was always meant to be shine through even at such a young age. I get to see her discover the beauty of life in all of it's simplicities. If I had to pick one quality about Maci that I've loved the most, it would be her observance of life and everything in it. She's aware of things, and wants to see things. In fact the comment we received the most when people would see her the first time was how alert she was and still is. She truly feels things, and experiences her surroundings and I think thats a beautiful human quality. It's quite remarkable to see myself and my husband in her. Not only in her physical appearance but in who she is becoming, and every day that passes I learn something new about her, as she learns new things about herself. You know those personality quizzes? The intense ones that take over an hour to finish? I took one a few years back, and i'll never forget it. I was working a corporate job at the time and they wanted us to discover our strengths so we could utilize them for our benefit. The quiz was extensive and long, and the questions seemed to be almost inconclusive to what I would envision a personality test to be. The results came back and I was completely underwhelmed with my number one strength, empathy. My coworkers around me had much more suitable strengths it seemed to me, Analytical, Focus, Achiever. These were STRENGTHS. Here I was with Empathy. Sounded weak to me, not like a strength at all. But upon further research I found it couldn't be more true of myself. Empathetic people have a healing presence, create trust, know what to do or say, and customize their approach. Sometimes I feel as though I can feel the emotions of another person as if they are mine alone. On the flip side, because empathetic people feel things so deeply we can be temperamental, and "soft". Weaknesses are true of any strength, but it is the opposites that make this whole life experience so beautiful. There have been times I've let the weak side of empathy take over, but I'd like to think that as the years progress I'm learning that empathy is why I am here. It's what took me to appreciate the delicacy and the quietness that flowers bring to my life. I think often times that translates through my work. I want my flowers to evoke a sense of calm tranquility, I want them to be thoughtful. Coming back to motherhood and what that role means, I've been thinking a lot about what an enormous responsibility it is. I've scaled back my business responsibilities so that time can be spent with her. So that I'm not only physically present but mentally present too. In some ways, I've found this industry to be going through bit of an epidemic. It's not just our industry, but the world as a whole actually. Everyone is racing for a finish line they will never be able to reach. It makes me fearful for my daughter, the social pressures that come from screens is nothing I could have ever predicted. The way images can completely take the mind to a place of sadness and dissatisfaction is unbearable at times and not a single person utilizing these platforms has been void of these moments. I am not immune to these feelings, myself. I believe Maci's personality is gentle like mine, but she's strong too. Incredibly determined, but also content. I hope as I mother I can teach her to utilize her strengths, and not succumb to her weaknesses. To always remember that it's the relationships that matter most, not the tangible succcesses and triumphs. To find joy in her life and seek those things, to create beauty in however that manifests itself to her. That you don't have to be ANYTHING to be someone amazing. That in a world that constantly tells us we are not enough, that it is possible to drown out the noise and remember that you are in fact, enough. Happy Mother's Day to all the women in my life who are mothers, grandmothers, daughters, sisters, friends, you are my world. Beautiful photos by Alex Steele. 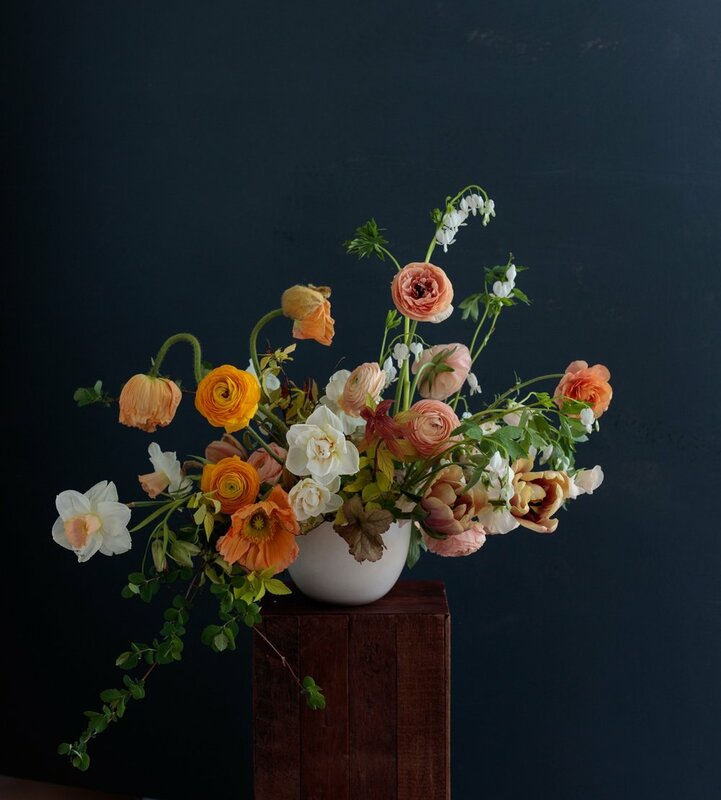 Last year in April I had the opportunity to create a few arrangements for the newly released title "In Full Flower" by Ingalls Photo and published by Rizzoli Books. So many of my flower heroes are on these pages and to be among them is humbling and a tremendous honor. About a month after I had Maci, Flower Magazine reached out about making some arrangements for their new Flower Show series. So many of my favorite designers have graced these pages so I felt so honored to create five different colorful arrangements for them. To read the interview, pick up and issue or visit this link.